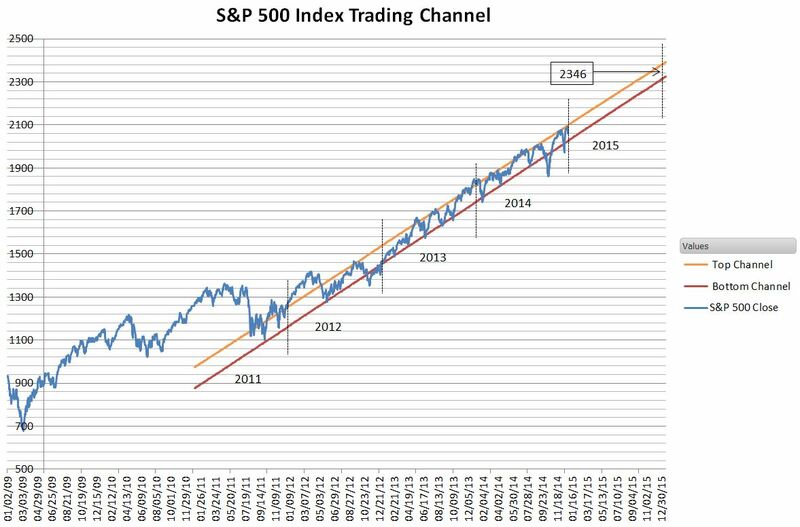 My 2015 year end prediction is based on the trend channel shown below, which has been in place since around May 2012. There’s nothing magical about this channel. The market will transition from it at some point, and I think it’s important to plan for that, but for the moment the channel is the trend. 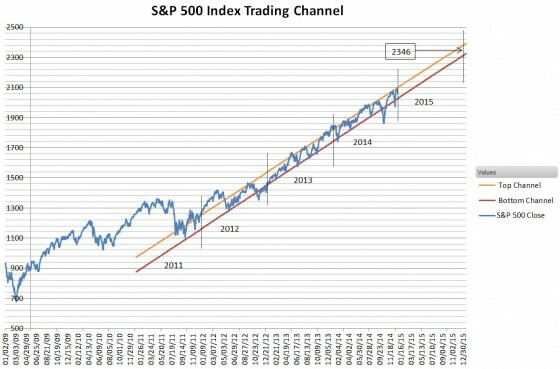 This sort of trend channel has characterized the last three bull markets. The blue line in the chart is the 250 day simple moving average. I suspect these patterns originate from random market moves—which often look like trend channels— interacting with human / computerized pattern matchers that transform random patterns into a self-fulfilling prophecies. When the market starts approaching the top of the channel followers start selling, and they buy when the low channel is breached—reinforcing the pattern. Anyone using that approach would have done very well the last two years. Colm relates how in 2006 and 2007, “I was thinking the markets were in a completely unsustainable bubble.”, but rather than try to pick the top his firm stayed long. “We were quite happy to be part of the bubble.” However they did limit their risk by doing trades with limited downside (e.g., buying options rather than the securities themselves), and they waited for things to change. When they did notice a big change (LIBOR rates spiking in August 2007) they moved to bearish positions. In the chart above, the last two bull markets signaled they were really over when the index was below the channel and below the 250 day moving average for more than a couple days. I will certainly be watching those metrics during 2015. The Fed has signaled that it may start raising interest rates in 2015. While the market might falter when this happens, I think the biggest issue will be the inflation rate behavior compared to the Fed’s 2% target. Some feel that the Fed’s actions in expanding the money supply created a powder keg that will explode once inflation starts rising. Others worry that increasing rates will undermine the recovery, risking sliding back into deflation and recession. I favor the latter because the Monetarists who think only the money supply matters regarding inflation have been completely wrong the last 5 years. The dramatic drop in oil prices has something for everyone. Commuters and airlines loving it, drilling equipment manufacturers hating it, oil tanker business loving it, holders of junk grade debt from energy companies hating it, and so on. Overall I think these impacts will mostly cancel out and since the energy segment of the economy was overheated I think some scaling back will be healthy. The majority of USA workers have seen their wages barely increase over the last decade while corporate profits have increased dramatically. Unless power shifts back to labor, unlikely I think, we won’t see general wages increases much over the rate of inflation. In the last four quarters S&P 500 companies spent $567 billion buying back their own shares—a year to year increase of 27%. While it pains me that companies apparently don’t think that they can find a better place to invest this money, I understand that preventing share dilution from stock options / restricted stock issuance makes sense (although most of these shares go to already highly compensated employees). What I abhor is companies (like IBM) going into debt to finance stock buybacks in an attempt to hide a deteriorating business. This behavior has bubble possibilities because the next recession will knock out these companies and those that hold this toxic debt. The European austerity policies, rather than solving problems have extended its recession and exacerbated unemployment. The Eurozone poses no danger of overheating the global economy. As the US economy grows the dollar will continue to climb—providing a natural braking mechanism as imports get cheaper and exports relatively more expensive to trading partners. In the year or two before the tech crash of 2000 and the financial crisis of 2008 the market felt overheated to me. Before those crashes there was an outrageously overvalued tech sector, and a vastly overheated home building / mortgage industry respectively. So far I don’t see the next bubble forming. Yes, trillion dollar student loan debt is worrisome, but I don’t see it crashing the economy. Yes, oil prices dropping 50%+ will put the pinch on oil business, but again I don’t see the domino effect that goes with the collapse of a bubble. To destroy the momentum of a growing economy requires a collapse on multiple fronts—no single facet has enough impact. So, for the short term—at least for a week or two—the trend channel is safe. SPXH—Hedging the S&P 500 For Free? What about 2011—will it be a replay of 2005?